I cringe to put this photo here; for gorgeousness to define this recipe, hop over to Pinch My Salt. I ran out of time to take a brilliant photo; I made this recipe, skipped the whip topping (no time), cut these beauties out of their muffin tin, dumped them on a plate and ran out the door. Shocking I even snapped a photo, though if I hadn't taken that extra 29 seconds to snap these cheesy wonders (the other 31 seconds of that minute involved a micro planer and an orange---a rapid attempt at 'presentable'), you might not have believed me when I told you 1. I made them, 2. they are heavenly---I tried them myself, and 3. they won a prize. Our kids' school has frequent fund raising events, and this particular one asked guests to 'please bring an appetizer or dessert.' Since I had printed out this recipe just a week prior (lucky recipe, didn't have to get in the back of the recipe line---it never made it into my binder), it was perfect timing for this event. People tried the desserts and voted on favorites; these cheesecake bites won, and I was given a token bottle of wine. Oven to 375 degrees. In bowl, mix graham cracker crumbs, sugar and butter with a fork until well combined. Divide crumb mixture evenly between the 12 cups of your mini-cheesecake (I made 15 in a mini muffin) pan. Press crumbs firmly onto the bottom and partially up the sides of each cup; set aside. Blend sugar and orange zest in a mini food processor (optional). In electric mixer, blend softened cream cheese, sour cream, egg, sugar and orange zest. Spoon cream cheese mixture evenly into the twelve cups; bake for 14 minutes. Remove from oven and place on rack to cool for 20 minutes then carefully remove cheesecakes from pan and let cool completely on rack. Put cheesecakes in refrigerator and chill until ready to use. (Here is where I ran out of time): just before serving, make whipping cream. In cold bowl, whip cream, grand marnier and sugar until soft peaks form. 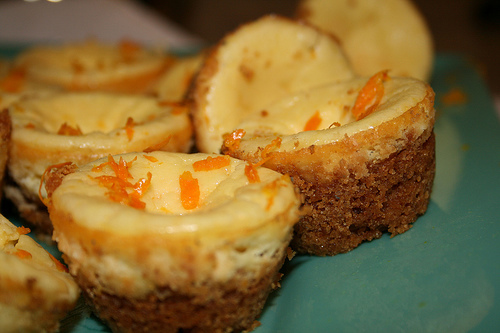 Top mini cheesecakes with dollops of grand marnier cream and serve. notes: I didn't have a mini cheesecake tin, so I used a mini muffin tin. They still tasted fabulous, but I think they woulda been prettier coming out of an official cheesecake tin. Go look at the photo already! Feb 13 what is on your to-do list? Feb 8 bean there, done that.